July 25th, 2007 : Rain and cool, Water temp 81*. Got a late start this morning, some of the guys got hung up on Wilson Bridge this morning and arrived a 1/2 hour late. Went uplake to catch bait but got busted on the way and 3 other "fisherman" followed me to the creek I was throwing in and after a few minutes of them frothing the water it looked like the surf at the ocean. I could only stand about 10 minutes of that foolishness I went to another creek and made 3 casts and caught about 300 baits and went fishing. Set up on our first school after 7 , all lines went down but needless to say my clients weren't quite ready for that kind of action. 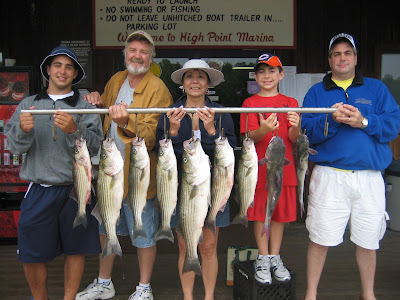 By the time we got settled down the fish had moved and so did we. The front hurt fishing this morning and had the schools scattered pretty bad. I spoke to a couple of trollers who fished all morning with poor success. 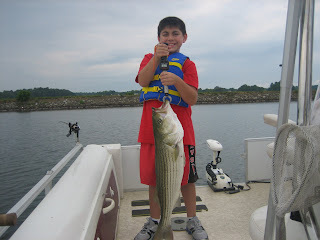 We hit 8 to 10 areas before camping out on a 40' flat and that is where Chris caught the 13 pound Striper. He performed like a pro today and is going to make a good fisherman. We had well over 200 strikes today and the crew took home a few fish to give away.